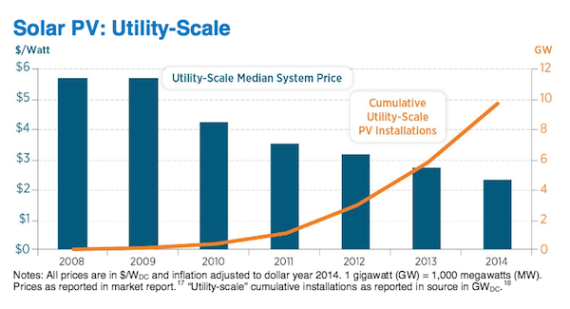 In what amounts to a giant group hug for the taxpaying public, the US Department of Energy is out with the latest update to its series of Revolution…Now clean energy reports. The new update takes us up to 2014 to underscore how quickly clean energy is taking root in the US, thanks in part to government support for developing new technologies and pushing them into the marketplace. 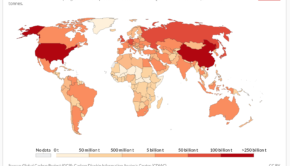 The latest Revolution…Now is also a not so thinly veiled Dear John letter to the fossil fuel industry in general and in particular, to ExxonMobil. The oil giant has been hammered in recent months for willfully misleading consumers and policymakers about climate risks related to its business model. The New York State Attorney General has already deployed state law to go after ExxonMobil for misleading its investors, and the new report could be part of an effort to build public support for parallel action by the US Department of Justice. To be clear, that’s just us thinking out loud. As stated in an Energy Department press release, Energy Secretary Ernest Moniz has timed the latest update of Revolution…Now to lead into the upcoming COP21 United Nations Climate Negotiations in Paris, which will be taking place as scheduled despite the attacks on the French capital last week. Wind is the first non-hydro renewable energy source to begin to approach the same scale as conventional energy forms like coal, gas and nuclear. 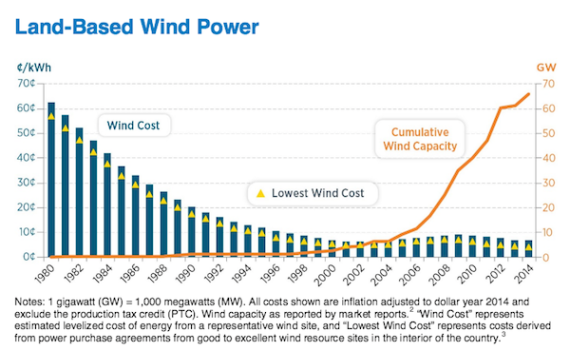 The cost decline correlates to a rise in the size and efficiency of wind turbines, especially after 1998. According to the clean energy report, the average single-turbine capacity has increased about 162% in just over 15 years, and overall wind capacity in the US has more than tripled since 2008. There’s plenty more where that came from. The US is just barely beginning to tap its vast offshore wind resources (no thanks to these guys), and despite some skeptics the Energy Department still provides support for developing the micro wind turbine market. This chart shows electric vehicle (EV) sales taking off after 2013, concurrent with the falling cost of EV batteries, so there goes your mobility market for fossil fuels. While the hydrogen fuel cell electric vehicle market is still in its infancy, we’re thinking that the emergence of sustainable hydrogen (water-splitting enabled by solar or wind energy) will eventually do some damage, too. Put the solar, wind, and EV trends together and you’re looking at a clean energy formula for continued economic growth in the US, a far cry from the “job-killing” picture painted by fossil fuel lobbyists and their supporters in government. While the first three charts are headline-grabbers, energy efficient lighting hasn’t sparked much public conversation ever since the usual suspects found some other controversy to replace the waning light bulb scandal. Improved energy efficiency in buildings correlates to an increased potential for replacing fossil fuels with clean energy and stationary energy storage, and as a ripple effect that creates more space in the electricity generating landscape for the mobile energy storage units known as electric vehicles. In other words, building energy efficiency is a critical piece of the overall clean energy puzzle, and LED technology is an important element in that strategy. As with the other three charts, the LED chart only hints at the future. 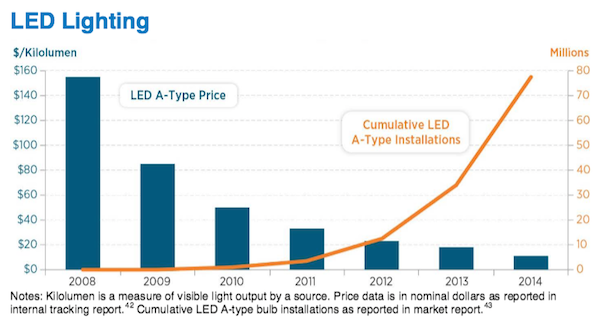 There is still plenty of room for growth in LED adoption and technology enhancements that lower costs. Secretary Moniz announced the updated clean energy report during a talk at the Carnegie Endowment for International Peace on November 13, almost to the hour that terrorists murdered 129 innocent people in Paris, with the group ISIS (also known by other acronyms) claiming responsibility. In the context of Paris, we are at a pretty remarkable place compared to what most thought, say a year ago. That’s a chilling contrast to events on the ground in Paris last Friday, but to the extent that petrodollars fund terrorists and justify destructive policymaking, perhaps Moniz’ optimistic outlook on the shared future of our little planet will be realized in more ways than one. Images (all, screenshots): via US Department of Energy.